The glittering event, with its theme "the beauty of Chinese style", was held in the coastal city in eastern Shandong province on Oct 10-13. Organizers said it proved to be a successful magnet for fashionistas, drawing company representatives, experts and delegates from 25 colleges and universities from China and other regions in Asia, as well as Europe, the Americas and Oceania. 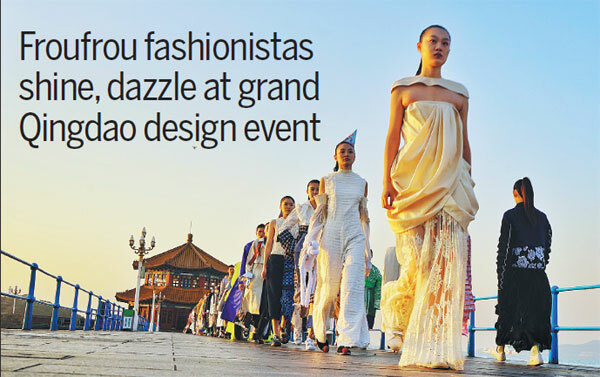 Co-organized by the Qingdao city government, the Beijing Institute of Fashion Technology and the China Fashion Association, the four-day event entertained with industrial networking activities, design shows, fashion film shows, a fashion competition and an awards ceremony. Organizers said it aimed to identify the competitive, talented young designers of the future. "The fashion industry is one of the most eye-catching industries in the world," said Zhu Shaofang, assistant to the president of the China Fashion Association. The industry represents one of the 'soft powers' of a country in terms of culture, technology and creative design, she said. The event was also an excellent opportunity for young designers from fashion design schools and companies from China and overseas, Zhu added, explaining that activities including a fashion review by authoritative industry insiders and fashion shows enabled the audience to fully appreciate the flourishing fashion designs. A total of 49 students from the 25 colleges and universities took part in the fashion competition - showing of 195 designs. The competition was judged by 15 experts and witnessed by representatives from 50 companies, institutions and media outlets. Factors for evaluating the work included market demand, artistic value and design professionalism, according to the event's organizers. A creative design dubbed Build by Wang Tong, a student of the Beijing Institute of Fashion Technology, scooped up four awards. Judges said its success was due to the unique design ideas and exquisite skill Wang employed. Inspired by architectural motifs, Wang selected a cold gray as the main color in his work and used knitted fabric as the material for his garments, creating a strong artistic sense of combining creativity with market demand, according to the organizers. The work features the designer's unique understanding of fashion and market trends, and is of both artistic and commercial value, said Li Hongqi, a representative from a menswear company. "This competition provides an opportunity for younger-generation designers to show their work and also gives companies the opportunity to identify creative talent in the fashion industry," he added. Another winner of the fashion design competition, Complex Simple, created by Luo Ying from ESLAP, an academy of liberal arts in Paris, was highly evaluated for its creative design that combined modern and traditional elements. The work also gained four awards. Luo utilized black and white as the main colors and chose silver fabric and colored beads to decorate the garments, making them suitable for different occasions and daily dressing needs. The work also won the approval of companies and top designers for its ingenious creativity. The Beijing Institute of Fashion Technology Park and 25 leading fashion colleges attending the competition jointly released a proposal to nurture young talent by pooling their resources in research, education and production. According to the proposal, the fashion colleges will launch joint programs to provide training and other services for young teachers, students and young company employees based on their educational resources and special courses. Support from educational institutes and companies is important for the career development of young professionals, said Wang Qi, chairman of an asset management company affiliated to the Beijing Institute of Fashion Technology. The event has created an opportunity for cultivating more professionals with international vision for the Chinese fashion industry, as partnerships have been forged between Chinese and overseas industry players, Wang said. Huang Kan, deputy director of the Beijing Municipal Education Commission, said that the development of the fashion industry required more skilled, insightful professionals. "The fashion industry is expected to get crucial support from international collaboration and the cooperation between companies and educational institutions," Huang said, adding that such cooperative initiatives can help mobilize resources at home and abroad for cultivating talented professionals. Zhang Qinghui, president of the China Fashion Association, said close cooperation between educational institutions and companies is especially crucial for the development of young designers. Earlier this year, the Beijing Institute of Fashion Technology signed an agreement with the Qingdao city government to build a fashion college in Qingdao, as part of its push to create a platform for the development of the fashion industry in the coastal city.